Sustainable South Seattle (S3) is a volunteer-run organization working to promote sustainability in Seattle's south-end communities. We've defined sustainability as living in a manner that allows current and future generations of all life on Earth to thrive. Sustainable South Seattle is a member of Sustainable Communities All Over Puget Sound (SCALLOPS) who connect neighborhoods taking local action to make their communities more sustainable. If you want to opt out of getting a phone book for this year - sign in and make your request before May 17th. Here’s how to stop unwanted yellow pages deliveries to your home or business in a few easy steps. Create your stop yellow pages delivery account on the CatalogChoice website. Click on Phone Books and choose the yellow pages phone books you want. Your opt out selection must be in effect 30 days before a company starts its Seattle distribution cycle. Choices for DEX yellow pages phone books must be made by May 16, 2011 in order to prevent delivery of books this year. The 15th Annual Kids' Bike Swap is here! Come on by this Saturday, May 7th, 2011, from 10 am - 4 pm at Genesee Playfield (43rd Ave S and S Genesee St). This annual event is an opportunity for families to trade in a bike their child has outgrown for a larger bike – just in time for the summer riding season! The Kid’s Bike Swap helps to facilitate the flow of affordable bicycles within the community and keeps fully functional bikes out of our local landfills. This year, Bike Works has overhauled over 145 kids’ bikes to kick-off the swap! At the swap, each bike that is brought to be swapped is assigned a trade value, which can then be applied towards a “new” bike. If the chosen bike’s value exceeds that of the trade value the “customer” is responsible for the difference. Typically, when a bike is exchanged, the “customer” is able to take home a newly recycled ride for $12 or less. Families looking to buy a bike, who do not have a bike to trade in, are welcome to come after 12 pm. Seattle Children’s will fit free bike helmets and provide education on bicycle helmet safety. There will also be a “Family Bike” expo, with examples of different bikes and trailers that allow families to be car free. As spring begins to show itself this year and gas prices climb over $4/gallon I start thinking about what sustainability truely encompasses. This video seemed both empowering and timely. Makes me want to take action and garden with my neighbors! Check out the video here. The Rainier Beach Urban Farm has become a reality - Friends of Atlantic City Nursery and Seattle Tilth selected as operators!! We have just learned that Seattle Parks & Recreation has completed its RFP review process and has selected the Friends of Atlantic Street Nursery and Seattle Tilth as the operators of the soon to be established Rainier Beach Urban Farm and Wetlands Preservation site. This is a great achievement for Rainier Beach and could not have happened without your support. So, Thank You! Over the last two years, many residents of Rainier Beach and supporters of the urban farm idea worked tirelessly to make this a reality. Some wrote letters of support, testified in public meetings, attended numerous community planning meetings and others recruited supporters through the blogshere - all this has paid off. This is one example of what is possible when a community comes together towards a common goal. The Friends of Atlantic City Nursery and Seattle Tilth are committed to making this a jewel not only in Rainier Beach, but in the Puget Sound region as a whole. With your help, I know that what we have achieved together can be a model for other communities to follow! To learn more about what's next and how you can contribute to this exciting adventure, please come and join us at the next community gathering (and celebration) on Saturday, May 14th at 10:00 am - 11:30 am at the Rainier Beach Public Library which is located at 9125 Rainier Ave. S. Seattle, WA 98118. You are invited to the community kick-off celebration for Community Power Works for Home — a program to help make your home more comfortable, efficient, and healthy. Did you know that most homes in Seattle waste so much energy it is like having a window wide open 24 hours a day, every day of the year? Community Power Works can help! Plus, learn how you could earn money for Sustainable South Seattle's Climate Cooperative by referencing "SWCLC" when requesting your energy audit. 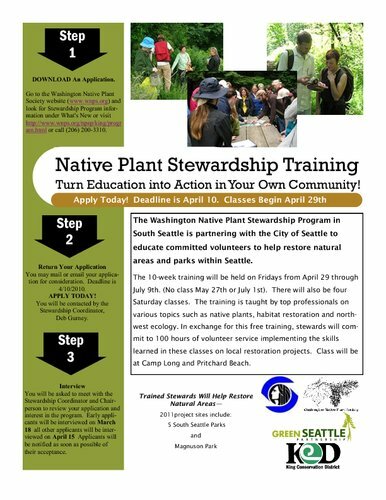 When: May 3, 2011, 6:30 p.m. - 8:00 p.m.
Where: South Shore School, 8825 Rainier Avenue S.
With the next project, we are following the progression of seasons from planting natives in the cold months to clearing out invasives and trash in the warm months. Our next project, Saturday, April 16 will kick off the spring and summer season of getting rid of things that don't belong in the canyon. Join us from 8:30 AM until 1:00 PM. We will meet under the blue tent at the trail head and will provide gloves, trash bags and refreshments. You will need to dress for the weather and wear sturdy shoes. Let's show Mother Earth that we love her by doing a project in our own area! Thank you for attending the community workshop for the North Henderson CSO Reduction Project on December 14 – we appreciate that you were able to take time out from your busy schedule to participate. The third workshop of this three-workshop series is coming up on Wednesday, January 19. Would you be willing to send notice of this workshop to you contacts, as you did for the previous workshop? Of course, we would also greatly appreciate your participation again! Please join us for a community meeting tomorrow night and show your support for bike lanes on Columbian Way and Othello Street in south Seattle. These bike lanes are being put in as part of a rechannelization or "road diet" project that includes a center turn lane for safety, and opposition is expected. Cascade Bicycle Club and the local community need you to show your support for these bike lanes! Where: Lakewood-Seward Park Community Club, 4916 S Angeleine St, a few blocks north of the PCC just off 50th Ave S.
Road diets have been shown to significantly improve the safety of all roadway users, including pedestrians of all ages and abilities. The bike lanes resulting from this rechannelization project are currently being installed on Columbian Way between 15th Ave S and Beacon Ave S, and are funded for Othello Street between MLK Way S and the Chief Sealth Trail. Seattle City Councilmembers (and south Seattle residents) Sally Clark and Bruce Harrell will be in attendance, along with Seattle Department of Transportation employees. Tell them why bike lanes in your neighborhood are important to you! What's New with Carbon Neutral Seattle? The next meeting of the Carbon Neutral Neighborhoods group is this Thursday October 28 from 5:30-7:30 in the Boards & Commissions room L2-80 at City Hall. We will present reports on successful City plans, programs, and policies from our Carbon Neutral Neighborhoods perspective. We encourage City staff and members of the other Carbon Neutral groups to join us at our meetings as we consider the Comp Plan, Neighborhood Plans, and City Departmental work plans as they are being revised from a sustainable neighborhood perspective. Our meetings are open and you are all cordially invited to participate. At our Sept 21 meeting we discussed what issues our Carbon Neutral Neighborhoods group could focus on in the future, in order to encourage City staff and elected officials to continue their support of our Carbon Neutral future. We decided to begin by exploring what programs the City does especially well right now to move us along a carbon neutral pathway. Many of these programs are listed on Seattle's Office of Sustainability and Environment website. We broke up into six groups to do more research and will report on our findings at the Oct 28 meeting. A complete Sept 21 meeting summary, including the working groups we formed, is attached. Some people in our group have requested remote meeting access in order to keep travel down. We have set up a "seattleneighbors" Skype account. If there is only one person, we'll be able to do video - if there are more, it will be audio only. If you plan to attend this Thursday's meeting remotely, please contact Gene Homicki for login details. October 21, 2010 - 6:00 – 8:00 p.m.
Do you suffer from Peak Oil Blues? Is "plant" a noun or a verb? Noun: We are getting 100s of native plants from several sources. Verb: We need to plant them next Saturday, October 16. REI will also have their annual booth with lots of wonderful give-aways for everyone. So, we need lots of volunteers to plant the plants. Meet us under the blue tent at the hairpin turn at 68th Ave. S. and Holyoke Ave. at 8:30 AM for coffee and goodies. Work begins at 9:00 AM and will take place in the Rustic Road and Bangor Street areas. Dress for the weather; wear sturdy shoes; and bring lots of enthusiasm. Tools, gloves and refreshments provided. Call Darrell or Jude at (206) 772-1452 for directions or additional information. Suggestions welcome. Last week, the Seattle Department of Transportation (SDOT) announced that - thanks to the voter-approved Bridging the Gap Transportation Levy - the City of Seattle is helping to fund 14,800 new hours of King County Metro Transit bus service, including an increase in service on south-end routes 7 and 60. The city is using $1.5 million in levy funds to purchase additional bus hours for Seattle residents through the county's Transit Now program. The program will continue for the next five years. Locally, the revisions to Metro routes serving the Rainier Valley include: Route 7 - About 80 trips per week will be added to improve frequency to every 15 minutes during weekday evenings and weekend mornings. Route 36 - Route 36 will return to its regular routing between Beacon Avenue South and South Myrtle Street, and South Myrtle Street and 39th Avenue South. It will no longer operate on Beacon Avenue South between Myrtle Street and Othello Street. The Route 36 shuttle will be discontinued.Route 38 - All service before 9 a.m. will be discontinued.Route 39 - Route 39 will return to regular routing between South Othello Street and 38th Avenue South and South Myrtle Street. It will no longer operate on Martin Luther King Jr. Way South and Renton Ave South between South Othello Street and South Henderson Street. "A couple, perhaps three, years ago Seattle voted for a sales tax hike to pay for expanded Metro service. Yet, since then I have seen only a decline in the service to my Mt. Baker neighborhood, on the route 14. In this recent shake up, Metro took away service to my neighborhood in the evening. Declining bus service only sends people back into their cars. Bring back any and frequent bus service and do not assume that people only need to take the bus for their commute." "It take me longer to get from Henderson and Rainier to my house than it does to get to Henderson Street from the University district. What does that say about our neighborhood transit options?" What Concerns YOU about Climate Change? Main environmental concerns/interests: Emissions! Climate change, the political ignorance that people who are our authorities have over important environmental issues and the fears and lies they promote. Alternative energy is also a huge interest. What ways are you reducing your carbon footprint? walking, renewable bags, recycling ("I carry my recycling things with me all day to my house if I can't find a place to recycle them"), water and coffee reusable bottles. What ways are you reducing your carbon footprint? Shop local, one car, walk, public transit, light bulbs/efficient CFLs, turning the heat down in the winter. Interested in gardening, in particular organic gardening and wants son to also be involved and learn more about it. What ways are you reducing your carbon footprint? "I'm trying to be mindful of plastic bags, waste generation and recycling." Also alternative transportation, volunteering for environmental projects and donating to environmental causes, buying green and being aware of environmental issues. Main environmental concerns/interests: "Failure of the system! You can't hide the problems. We need to switch to a non-profit cooperative system!" Is against the 99 tunnel idea. What ways are you reducing your carbon footprint? No car - bike or walking or use of public transportation. Are you concerned about your carbon impact on the earth? "Heck YES!" Are you interested in learning more about carbon reduction strategies: "YES!" We are happy to hear your thoughts Southeast Seattle! Keep it coming, join us on October 20th for the Climate Co-op Kick Off Event. See our Google calendar for location info. Next Tuesday evening, the Seattle City Council is hosting a Community Forum from 6:00 to 8:30 pm at City Hall in the Bertha Knight Landes room. The Council will hear from community members who will present recommended actions that Seattle should take over the next 1-3 years as we start down the path towards carbon neutrality. As you recall, making Seattle a carbon neutral city was one of this year’s Council-adopted priorities. Staff throughout the city are working on evaluating policies and actions that Seattle will need to take to make this commitment a reality. In addition to the great internal work, a number of community groups have formed, met, and drafted recommendations for actions the city can take to meet this commitment. I’ve reviewed drafts of many of these recommendations, and I am impressed with the thoughtfulness of these recommendations that are both grounded in reality and will challenge us to tackle bold issues. We are hosting a website for these efforts, which can provide helpful background on this effort here: http://carbonneutral.seattle.gov/community-ideas/. Carbon neutrality is a big goal which will require everyone working together to achieve. I hope you will consider joining me at this event to hear ideas and recommendations. Time to begin the Fall and Winter planting season in Dead Horse Canyon. We will be doing site preparation on September 18 so that we can plant native plants every month from October through March. Darrell and the rest of the Wednesday group have been hoarding potted plants in the backyards all summer long. So we have lots of plants available and they need to get rid of some of them before their lawns die from having too many pots on top. Come join us at 8:30 for conversation and coffee. Work begins at 9:00 and lasts until 1:00 PM. We have jobs for all ability levels. Come for all or part of the project. As usual, refreshments, tools and gloves will be provided. Wear sturdy shoes and dress for the weather. We meet under the blue tent at the trail head at the hairpin turn at 68th Ave. S. and Holyoke Ave. Look for and turn at the Pizzaria Pulcinella sign. Call Darrell at (206) 772-1452 for additional information. Suggestions are always welcome.